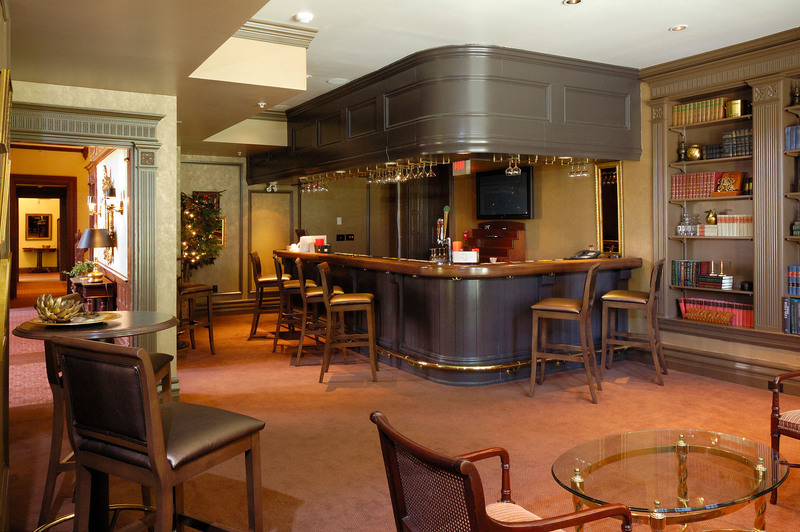 The interior of Lancaster’s most prestigious private social club, in a building dating back to 1890, needed an update for the changes and uses of today’s club members. 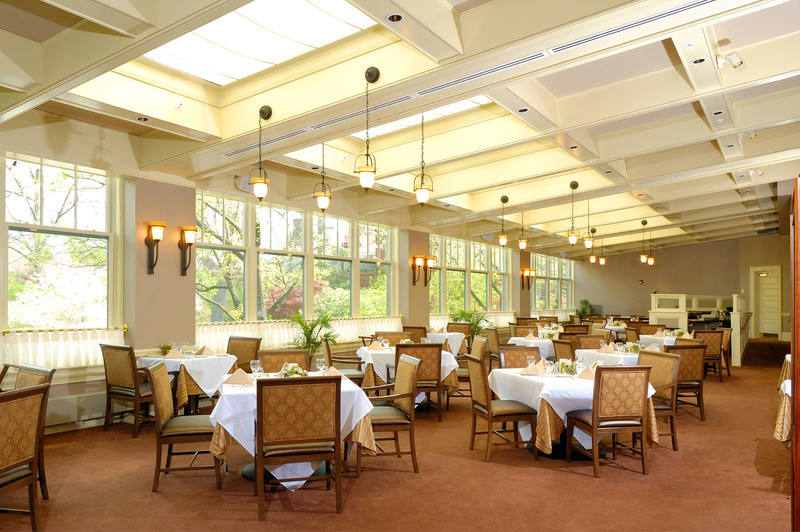 Along with larger function spaces with bars, health & fitness facilities, modern restrooms and an overall less formal atmosphere, the renovation included this new, casual dining room. It is filled with natural light from windows and skylights during the day while charming pendant lighting illuminates the room for evening meals. 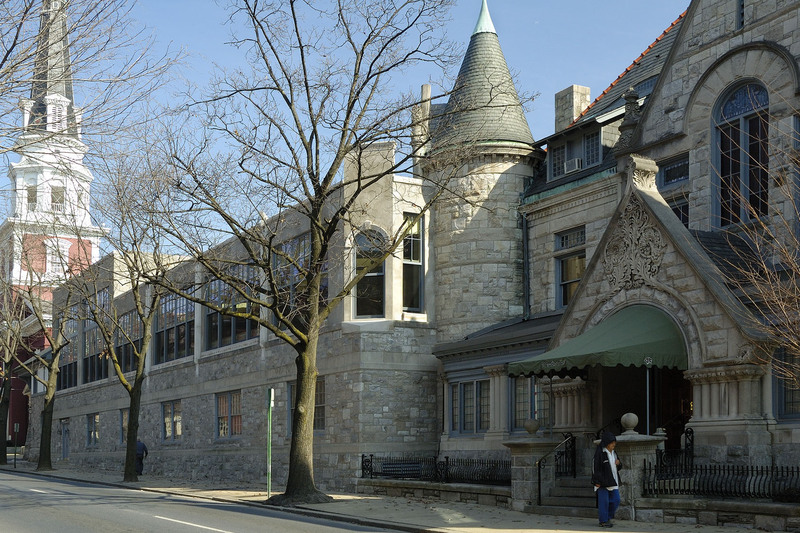 Built in 1898 in the ornate Chateauesque style, the original stone mansion and carriage house was expanded in the 1950s to meet the private club’s growth. To meet continued membership demands, we proposed a vertical expansion on the roof of the 1950s building. A turn-of-the-century mission style was selected for the new addition to allow the Chateauesque forms and details to remain the prominent style. Historic reference design concepts were employed to blur the distinction between period styles. Stone walls and trim combined with windows in proportion with historical windows and match the mansion elements to create a harmonious design. 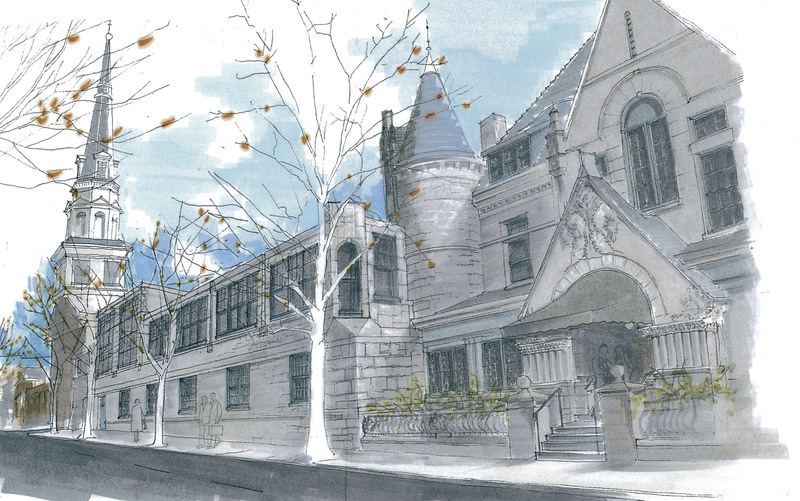 A schematic rendering of the street view of the main entrance and second floor addition provides a visual reference for members and was used for approvals by the owner, city, and Historic Architectural Review Board. 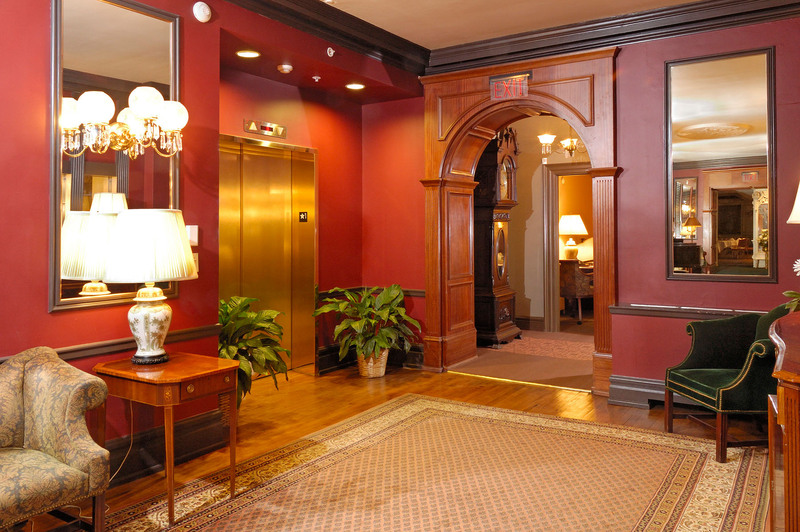 “Peacock Alley,” the main corridor to the dining room, has a new state-of-the-art elevator with programmable controls that allow hospitality staff full use, along with member access. The new color scheme brightens the area with a fresh elegance complimented by new dark-stained flooring. Reinforcing the historic period of the original building through the use of paneling and wood treatments, this new bar area is three times larger than the original bar. With more tables and seating, it’s now a popular area offering four times the capacity of the older space. Furniture chosen for its comfort and character coordinates with warm, muted earth tones in fabrics and finishes to create a relaxing atmosphere for people to linger and socialize. Interior walls and spaces were moved to make room for the new staircase to the lower level casual dining and recreation area. 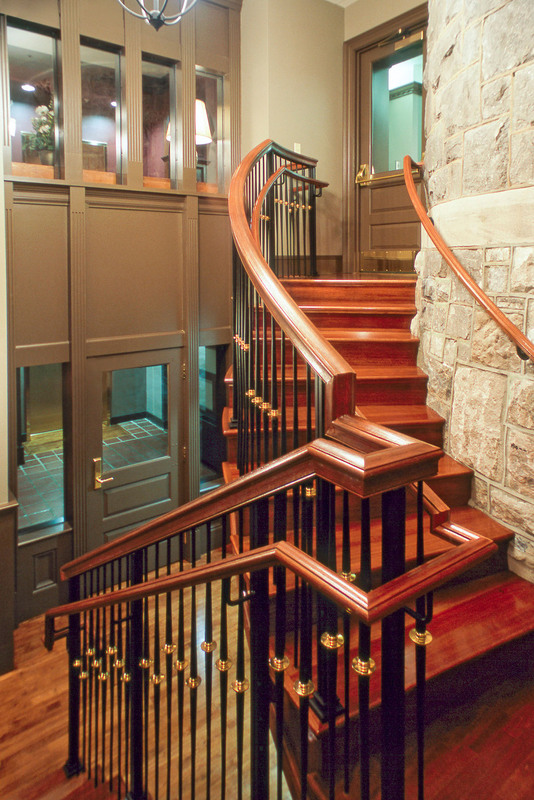 To meet codes, fire-rated materials are used in the stairs, cleverly designed as historic-looking details, rails and materials that retain the richness and elegance of other interiors in the building. The stone tower that wraps the staircase had originally been an exterior wall that was exposed during the renovations.